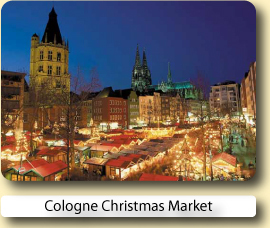 The Aachen Christmas Market is Germany's nearest Christmas Market to the UK and can easily be reached from London in less than 4 hours by train. 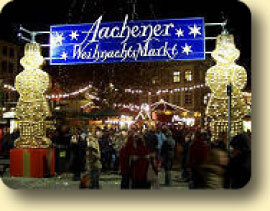 Aachen's brightly lit Christmas market is set around the cathedral and town hall. This lovingly decorated "Christmas village" on the market square has everything your heart could desire. One local speciality you really must try is the Aachen Printen, a kind of gingerbread. Every year before Christmas the squares and streets around the Aachen Town Hall are transformed into a paradise of lights and colours, festive sounds and seductive smells. The glorious fair in the Christmas City, which has been erected with great care and sentiment, fascinates both the young and the old. The enormous choice between the original, stylish and precious goods makes small and big dreams come true. It is really no wonder why the Aachen Christmas Market has become an absolute "must" for all people of Aachen and Aachen fans as well. 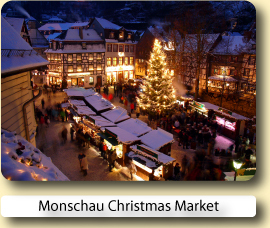 The Aachen Christmas Market has become famous far beyond the boundaries of the Aachen region, this is due to its pleasant and familiar atmosphere. 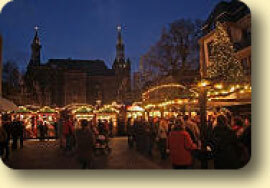 People come to the Aachen Christmas Market in order to meet their families, friends, acquaintances and colleagues. This happens during the lunch break or after work, during the week or at the weekend. The carousel is a must for children as is the mulled wine for adults. Potato fritters are eaten at all times of the day. Naturally you will find a large variety of Printen and other Christmas cakes and biscuits, "Domino Stones", gingerbread, "Spekulatius" and marzipan bread. These are distributed all over the world by Aachen bakeries. However at Aachen Christmas Market they come fresh from the oven and taste much more delicious. The tradition of the Aachen Christmas Market goes back to the seventies. Originally when it was held around the Elisa Fountain the "Printen Market" was rather small. A huge change took place when it was moved to the Market Place and the Katschhof as well as the adjoining small streets. Not only have visitor numbers rocketed but also the number of exhibitors has continuously risen over the last few years. This way the choices of culinary delicacies as well as that of beautiful works of art and crafts have increased every year ever since. 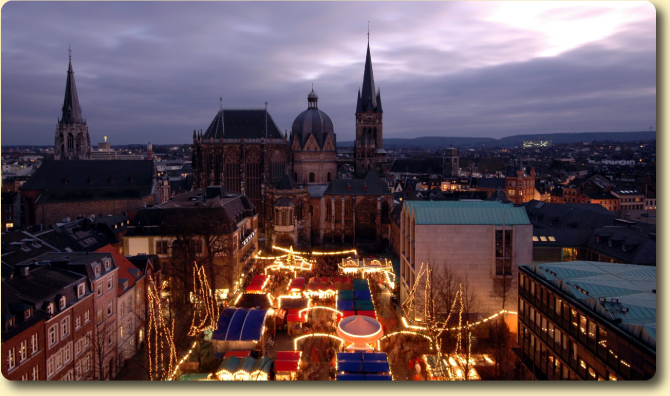 Visitors to the Aachen Christmas Market are faced with a great deal of choice and this is why they come back year after year to see the colourful stands and stalls. 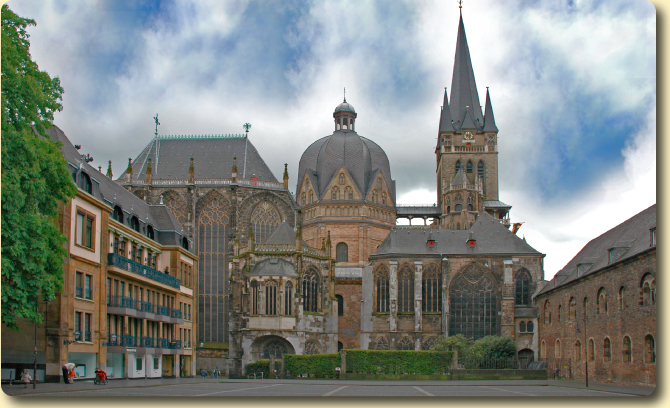 Aachen calls itself ‘The City in the Heart of Europe’, for it lies directly on the Belgian and Dutch borders, making it a convenient base for daytrips to Liège and Maastricht, as well as into Germany’s scenic Northern Eifel to the south. It is still often referred to as Aix-la-Chapelle, after Charlemagne’s great Palatine Chapel, now part of its glorious treasure-filled Cathedral and a ‘must’ for any art-lover. 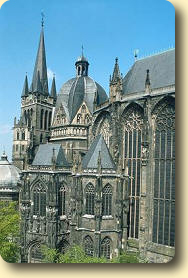 The source of the city’s fame is the Aachen water which was already known to the Celts and Roman legionaries. It is heated by the Eifel volcano up to a temperature of 74°C and is known to be the hottest volcanic spring water north of the Alps. Not far from the Cathedral is the Historical Town Hall surroundedby mediaeval small streets and the market. A large number of pubs, restaurants, shops and museums can be found at all corners of the city, which create an interesting and lively atmosphere. Good location, 5 minute walk to shopping and Christmas markets and plenty of restaurants. Comfortable rooms, staff for whom every question was meet with a smile. Good location. Good service and helpful staff. Good breakfast, included in rate. Walking distance to city. Nice hotel on a quiet street about three blocks from the main train station and a 10 minute walk to the center of the city. 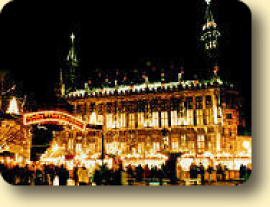 Book your hotel for the Aachen Christmas Market with Expedia or Hotels.com.Both online reservation services will let you compare and book hotels at great low prices.